AT 2 WINNER OF TWO PENNSYLVANIA SIRE STAKES, REYNOLDS MEMORIAL, THIRD IN THE ARDENDS DOWN STAKE. POSTED A 1:52.2 MARK AT TWO. AT 3 WINNER OF THE $500,000 HOOSIER CUP FINAL, FINAL OF THE $300,000 MAX HEMPT MEMORIAL, LEG OF A PENNSYLVANIA SIRES STAKE, ELIMINATION OF THE MEADOWLANDS PACE AND SET A WORLD RECORD IN WINNING AN ELIMINATION OF THE ADIOS STAKE PREVIOUSLY JOINTLY HELD BY SHADOW PLAY AND DALI. AS A FOUR YEAR OLD COMPETED IN MANY OPEN AND PREFERRED EVENTS, DEFEATING THE LIKES OF WON THE WEST ($3.9 MILLION) ONE MORE LAUGH ($2.6 MILLION) ROLL WITH JOE ($1.8 MILLION) HYPNOTIC BLUE CHIP ($1.7 MILLION) AND UP THE CREDIT ($1.3 MILLION). 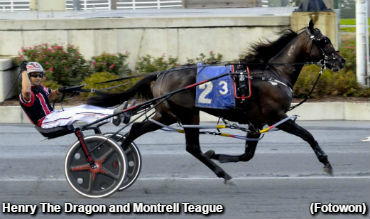 CONGRATULATIONS MONTRELL ON WINNING YOUR 1000TH RACE WHILE DRIVING THE 2 YEAR OLD SON OF CUSTARD THE DRAGON, "HENRY THE DRAGON" 151.3 $211,800. WINNER OF THE $100,000 DELAWARE BREEDERS FUND STAKE FINAL IN HARRINGTON AND SECOND IN THE $100,000 BREEDERS STAKE FINAL IN DOVER. NOW 7 WINS 1 SECOND IN SIRES STAKES ACTION. 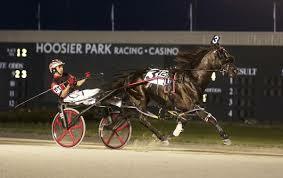 NOW THE SIRE OF 2 YEAR OLD TRACK RECORD HOLDER GO NINE O 1:54.3. WINNER OF THE 2018 HORIZON PACE. ​DOMINATED THE ALBERTA AND BC STAKES PROGRAMS WITH 37 WINS IN 2018! 2017 TWO YEAR OLD ASHA COLT OF THE YEAR. 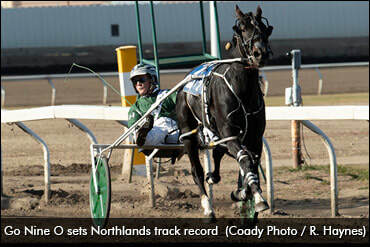 NORTHLANDS PARK 2 YEAR OLD TRACK RECORD HOLDER 1:55.